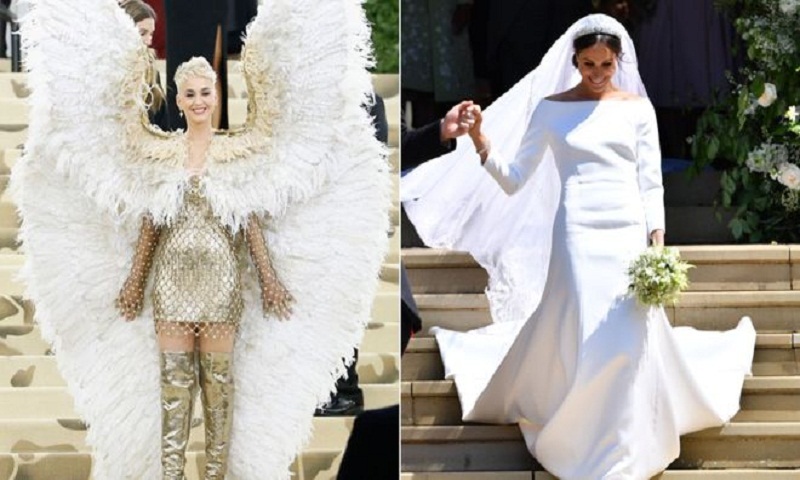 American Idol judge Katy Perry has criticised Meghan Markle's wedding dress. Perry told Entertainment Tonight that the Duchess of Sussex's Givenchy gown needed "one more fitting". The pop star suggested it fell short of the bridal look Alexander McQueen designed for the Duchess of Cambridge's marriage to Prince William in 2011, adding "Kate won!" "I would have done one more fitting," Perry quipped of the Duchess of Sussex's Givenchy gown. "I'm never not going to tell the truth! One more fitting, but I love you." Kensington Palace said the Duchess chose to work closely with the Birmingham-born designer because of her "timeless and elegant aesthetic, impeccable tailoring, and relaxed demeanour". The minimalist boat neck, which framed Ms Markle's shoulders and emphasised her waist, heavily contrasted with the Duchess of Cambridge's high V-necked lace-covered gown in 2011, which was designed by Sarah Burton of Alexander McQueen. Perry made the remarks while speaking to Entertainment Tonight's Lauren Zima during night one of the American Idol finals. "It's amazing what she's doing with all this, her humanitarian efforts," she said. "The fact that she's a proud feminist, I love all that. I support her as another woman and love her and wish them both well," Perry added.